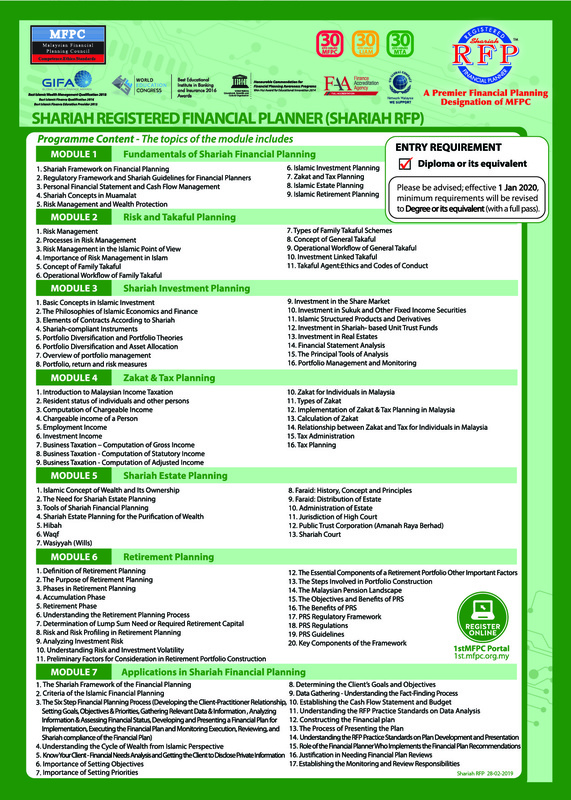 In line with the national agenda to make Malaysia the Islamic Financial Centre and to promote advancement in Islamic transactions and businesses; MFPC has developed Shariah RFP Programme as a practical professional programme for practitioners to equip themselves with Takaful and Islamic financial planning principles and knowledge. Y.B Dato’ Seri Mohamed Khaled Bin Nordin, Minister of Higher Education launched the Shariah RFP Programme on 21st August 2008. The Shariah RFP designation is recognized by Bank Negara Malaysia as an approved qualification for the Financial Advisor’s Licence. To increase and enhance the pool of Islamic Capital Market expertise through training and education. To provide an understanding of the influence of Shariah in the business context and prepare graduates to hold key positions in the Islamic Finance and Takaful Industries. To provide an international benchmark qualification that will equip candidates with a practical understanding of Islamic Financial Planning. To introduce more competitive and innovative Islamic financial products and services. To increase the awareness of Malaysia’s Islamic Financial Planning on the domestic and international levels. To establish strategic alliances between Malaysia and other Islamic countries. Branding of Professional Image – MFPC is a Self Regulatory Organisation (SRO) and Membership enhances long term public image. Venturing into the financial planning profession – Shariah RFP designation provides entry opportunities to professionals who wish to venture into the financial planning profession. Leadeship Quality – Being and MFPC member, you will be accorded a place among a group of pioneer Shariah RFPs who are instrumental in the development of financial planning in Malaysia. Platform for exchanging views and networking activities – MFPC Membership provides a strategic platform to interact among industry players and regulators for the exchange of views and knowledge on the development of financial planning, both locally and internationally. Participation in Financial Planning Education and Advisory Services – Shariah RFPs are given priority to be Certified Shariah RFPs Trainers. Registered Shariah RFP are encouraged to actively participate in lecturing Shariah RFP Modules and conducting of seminars / talks on financial planning subjects. The MFPC strongly recommends Shariah RFPs to hold advisory positions in various boards and committees in the related industry via AKPK and local universities. 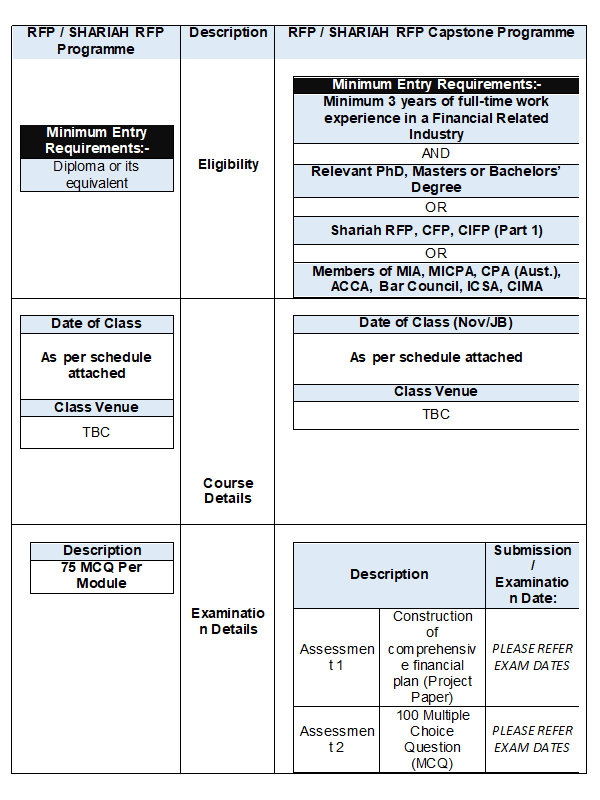 Professional Indemnity (PI) Insurance Scheme – Members of the MFPC have the unique privileges to be enrolled in the PI Insurance Scheme specially tailored to the requirements of Bank Negara Malaysia. Financial 1st Magazine – Financial 1st Magazine published by the MFPC is exclusively free-of-charge to the Ordinary Members. A special membership discount of 10% is given to members who wish to advertise in the in the Financial 1st Magazine. Priority and Special Offers to MFPC Members – MFPC members are given special discount and priority standing in all MFPC promotional and publicity activities e.g seminars, workshops, advertisement campaigns, and conventions. In response to the market demand and environment changes locally and internationally; MFPC introduced the “Affiliate Shariah RFP” designation to Members who have passed Module 1: Fundamentals of Shariah Financial Planning and one other module of Shariah RFP Programme. Affiliate Shariah RFP is intended to provide a pool of qualified practitioners to venture into the Shariah financial panning profession in Malaysia. Please click here for Classes. Please click here for Exam Schedule. If you are interested in joinning us, you can email to edutraining@mfpc.org.my or call us now. For information on our programme for your staff, and the corporate packages we offer, please contact our Education and Training department at 03-62035899.